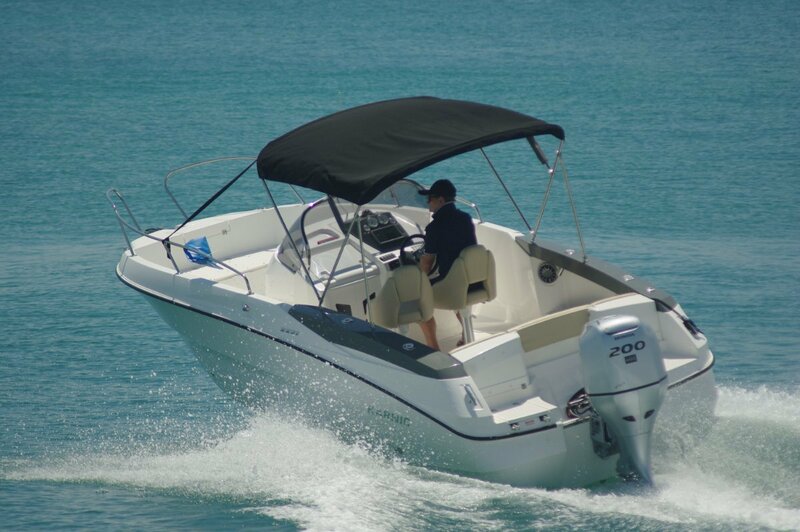 Larger centre consoles tend to be pretty versatile boats, and versatile is a word that sums up the Karnic 2251. Big enough for a day out with the whole family plus friends, roomy and stable enough for a bunch of fishermen, and with a weatherly hull for offshore work. The console is a beefy affair with plenty of width ahead of the pair of swivel seats. A hatch in it reveals a lot of volume available for storage, kids’ playroom or a chemical toilet. The review boat used the storage option for the materials that convert the Karnic from a fishing boat into a day cruiser. There is a vast amount of seating on board, all equipped with easily removed upholstery. On down and dirty fishing days the console’s interior is the place for this stuff. For family days not only can the softness be restored but infills can turn everything forward of the console into a vast day bed. All the seats have storage below them. Those at the bow and quarters have drainable bins that suit them for ice slurry chilling of drinks or catch. Our Karnic was powered by a 200hp Honda, close to the maximum recommended. Top speed was spot on 40 knots, which was very useable on the gentle review day. One of many good things about the current generation of four-strokes is they can cope with prolonged spells at low speed as well. This is just the boat for cruising up the Murray for lunch at the Ravenswood, or up the Swan to Riverbank Winery. Driving is a pleasant task sitting or standing, in either case well shielded by the windscreen. This curved structure has an interesting frame, with glass embedded rather than attached. At the lower corners the glass is notched, converting those bits of frame into hand holds in exactly the right places. Lately I have been encountering four-bladed props more frequently. In the early days of stainless props I recall them delivering a lesson in grip to the aluminium equivalents. The addition of the fourth blade turns grip into death hold. Whatever the extremity of the manoeuvre nothing could make ours think about letting go. 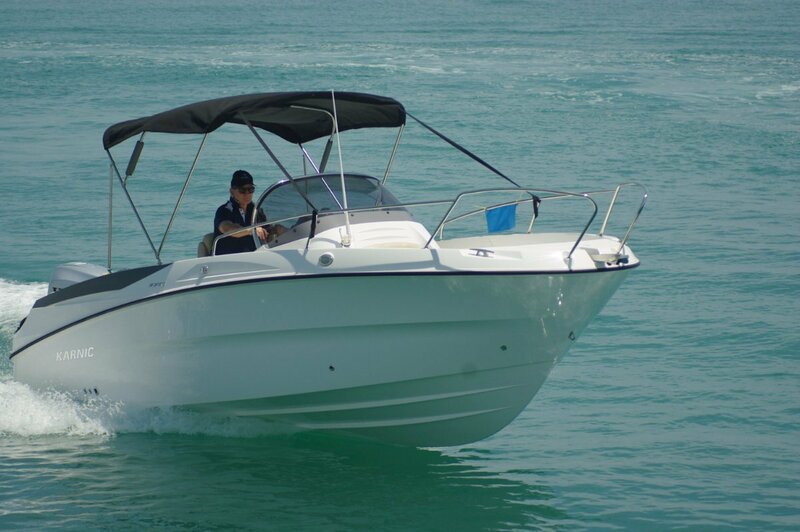 This boat has exceptionally high sides above its self-draining deck, an asset for both fishing and family occasions. In particular, with the children seated up forward – which is where they will insist on sitting – there is a lot of side above them. The driving seats are swivelling pedestal jobs, allowing them to face aft and share a removable table with the seats at the transom. Unlike on many boats this table is not an encumbrance in its off-duty moments. It is swallowed by the huge volume below the rear central seat segment. The back of this seat, which is also the front of the splash well, folds to allow the motor to tilt. 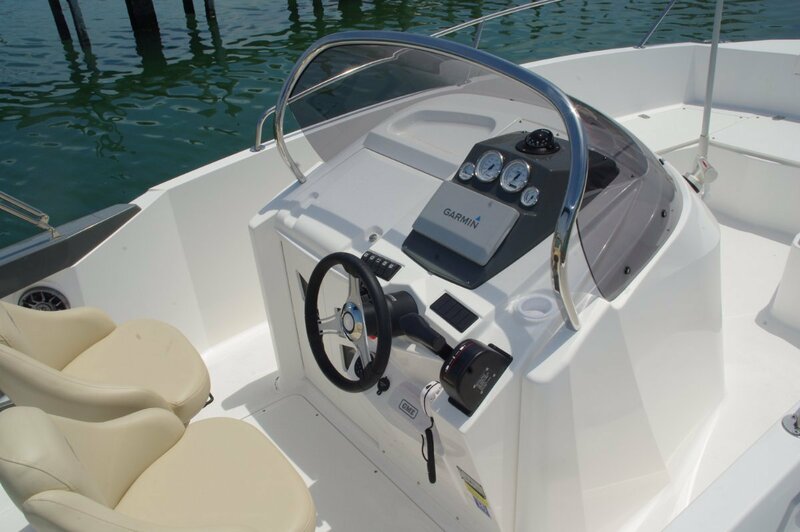 The Bimini has enough size, depending on the boat’s angle to the sun, to shade the whole of this rear seating area. Furling it takes just a few seconds for those purist anglers who grudge anything that gets in the way of rod movement. This is the standard sunshade. A stainless steel-framed T-top with rocket launchers is an option, this device extending its shade forward of the console. Not a lot of dedicated fishing equipment is built in; the ice slurry tanks and some rod holders sum it up although anything can be added on. There is a 9-inch Garmin combo that is a half-time fishing tool, and the stereo is an item surprising numbers of anglers insist on. Mass produced used to mean, in most people’s minds, something down market, definitely on the ordinary side. In fibreglass production it can mean the opposite, and the Karnic is a good example. Open lockers, look under things and you will not see flow coat (the coating of the side of fibreglass that does not contact the mould) anywhere. Cleaning this boat is a wiping not a scrubbing job. Having every part of the boat off-mould is a money saver for the builder, and possibly only incidentally a convenience for the customer. Who cares?